Vera English lavender, is known for its sweetly fragrant oil, dark lavender-blue flower spikes and compact growth habit. Very cold hardy. In the past few years lavender has become quite the plant—for gardens, herbalists and craftspersons. With its current popularity, lavender graces the gardens of many homeowners and the fields of many commercial growers. Lavender's innumerable uses range from flavored vinegars and jellies to sachets, potpourri, candles, soaps, aromatic in pillows, shaving creams and cleaning supplies. Since it is such a popular ornamental plant you can find Lavender, such as Lavender Sharon Roberts, in most gardens. Many cosmetics including bath and beauty products such as lotions, lip balms, and bath salts contain the essential oils of lavenders. But perhaps the best use of lavender is as an ornamental plant in the garden. Its silvery leaves, fragrant flowers, and bushy growth habit make it an excellent plant for borders, rock gardens, and perennial borders. Its feathery purple spikes aren't only pretty, they also smell great. Two good books for gardeners are Lavender: The Grower's Guide by Virginia McNaughton and Lavender—How to Grow and Use the Fragrant Herb by Ellen Spector Platt. Lavender is indigenous to the mountainous areas of the countries bordering the western European part of the Mediterranean region. When early travelers brought it back, the plant spread fairly rapidly to other parts of the world, and by the sixteenth-century lavender was already a much-loved plant in English gardens. The first lavender plants found in America made their way here sometime after the first European settlers. Records show lavender has been in use for over 2,500 years. The early uses of lavender were at least as numerous as today's, but they tended to be more of a medicinal nature. 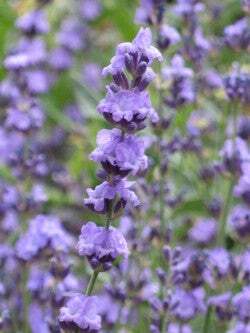 Biblical references to lavender are found in the gospel of Luke by the name used at that time, spikenard. Lavender was also used in ancient Egypt for mummification, and the Romans scented their public bathhouses with it. The name lavender is derived from the Latin verb lavare—to wash.
Blue Cushion Lavender forms a compact, rounded cushion of fragrant, evergreen foliage with profuse violet-blue blooms from early to late summer. Lavender's association with washing and bathing has an interesting history. In Medieval and Renaissance Europe, washerwomen were known as "lavenders" because they spread their laundry over lavender bushes to dry for the scent it gave. Royalty is known to have used lavender for the bath, most notably Louis XIV who loved bathing in lavender scented water. Wee One English Lavender is a dwarf Lavender, small enough to fit in any garden bed. Lavender is known for its soothing, relaxing qualities and has been used to treat hyperactivity, insomnia, headaches, toothaches, sore joints, and rumbling digestive systems. It was also used to ward off diseases such as the plague and cholera, and in 17th century London, people tied small bunches of lavender to their wrists to prevent the deadly diseases. In the 1652 book The English Physician, Culpeper wrote, "two spoonfuls of the distilled water of the flowers taken helpeth them that have lost their voice; as also the trembling and passions of the heart, and faintings and swoonings." Current medicinal uses promote lavender as a mild sedative and an aid to relieve neuralgia pain when used in the bath. It's also used for treating bruises and insect bites with a compress. Lavender sprays are also purported to discourage mosquitoes. Lavandula 'Fred Boutin' has silvery grey foliage and is known as Hedge Lavender because it is used for edging or border planting. Lavender has long been considered an herb of love, and Cleopatra supposedly used it to seduce Julius Caesar and Mark Antony. In Tudor times, a lavender brew was taken by maidens on St. Luke's Day to discover the identity of their true loves. Lavender under the beds of newlyweds ensured passion and put in the pillows of Alpine maidens it brought hopes of romance. For centuries it's long been thought to be an aphrodisiac. Early household use started with lavender strewn on the floors of castles and sick rooms as a disinfectant and deodorant. It was sold in bunches by street vendors and placed in linen closets as an insecticide to protect linens from moths. Lavender was burned in sickrooms to clean the air. Many Christian homes featured lavender formed into the shape of a cross, which was then hung over the door as a safeguard against evil. In Ireland, brides wore lavender garters to protect them from witchcraft. From its early cultivation and use to its presence in today's gardens, lavender has a long and varied history. Planting some in your garden will ensure a scent that people have enjoyed for thousands of years.